A new Rafter Layout system that simplifies the Traditional Roof Frame Layout method. The Tool is a 3 dimensional protractor, all the angles are converted to degrees and factors for rafter lengths are also provided in the instructions. 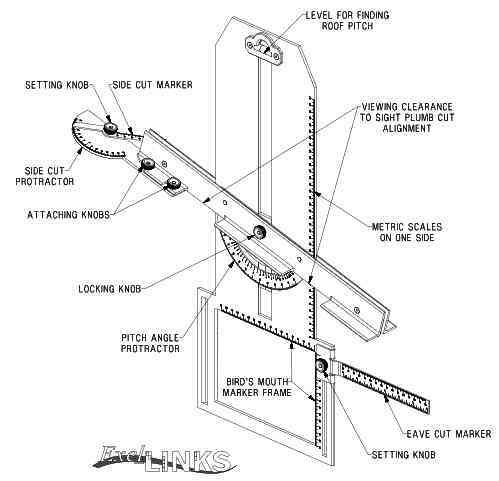 Adjustable roofing protractor - The general layout of the tool. One face of the protractor reads metric and the other side reads imperial measurements. This tool has the scope to set out almost any roof frame needed. Irregular and non-standard can also be set out provided the correct computer calculated cutting list is supplied for set out. The plastic version will be sold in Australian Hardware Stores July 2008. 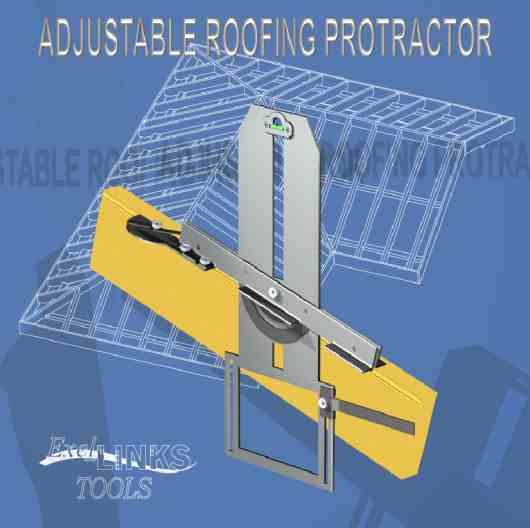 Adjustable roofing protractor - The tool with particular application to setting compound angles. 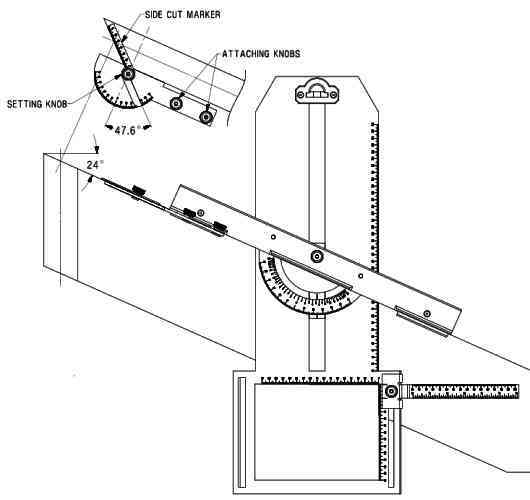 The inventor of the adjustable roofing protractor, Derek Pater has his own website and he can be contacted there. Derek sent me details of his invention some months ago, and it was considering this particular tool, that got me into building this section for inventions. The protractor is a tool that a complete amateur could buy in a hardware store and within a very short time they could be setting out a simple roof. It comes with a complete set of instructions and a set of angle tables for just about any roof. Personally I don't use angle tables as I was lucky enough to to be taught when I was an apprentice, by people who had the time and the inclination to show me the old way of solving roofing problems by basic geometrical drawing. What we are talking about here though, is not how to get the roofing angles, Derek provides a simple way to do that, and I use another way, we are talking about an actual tool that can be used to transfer those angles to the timber or steel as the case may be. On a first glance at the images above you could be excused for wondering what the heck it is, I know that I did, until I began to see the logic of it. As a tool I think it stands alone with it's different features. The spirit level bubble could be useful for measuring the angles of an existing roof that is being added to. Personally I used a 1200 long spirit level, hold or wedge it level and measure the fall with a tape at right angles to the level. This is more accurate but then I still need a calculator and a knowledge of trig to get the angle. The ability to mark an accurate birdsmouth in the same tool is I think unique. I also note that the depth of the birdsmouth is defined from the top of the rafter, so that rafters of unequal depth are no problem. The fact that there are two built in protractors at right angles to each other, I think, makes it unique again. There are many compound angles in roofing, that is basic, but there are also many other places where compound angles occur. Normally we use two bevels to set these out. The danger is that when the angles are close together it is possible to get them mixed up and make mistakes. Using the one tool mistakes that are possible with two bevels just can't happen with this tool. Derek kindly sent me a sample of the protractor, and while it does everything that is described above, my first impression was that it is not solid enough. I honestly think that it wouldn't stand up to the rough and tumble of a building site, and in and out of a carpenter's tool trailer etc. in the long term. I have since been told that there will shortly be a metal version which will of course solve this problem. For the non-professional roofer the current model should be ideal. Used sensibly it will last and do the job excellently.